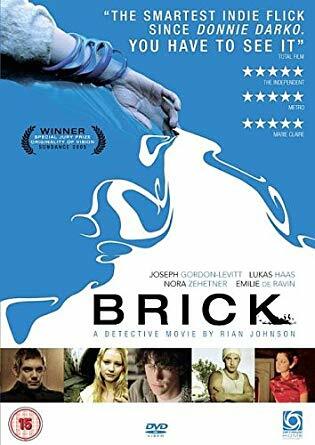 Brick (2005) is a valiant attempt by writer/director Rian Johnson at a neo-noir applied to the millennial generation. Joseph Gordon-Levitt' immense talent, in the leading role which he has cultivated during his decades of experience despite being a relatively young man, certainly helps Johnson's script and direction. But Johnson's talent would be noticed and indeed regarded, as he would later go on to direct some of the most iconic episodes in the final season of AMC's Breaking Bad. As for Brick, the originality is commendable and I suggest a viewing. After receiving a frantic phone call from his ex-girlfriend, teenage loner Brendan Frye (Joseph Gordon-Levitt) learns that her dead body has been found. Vowing to solve her murder himself, he must infiltrate high-school cliques that he previously avoided. His search for the truth places him before some of the school's roughest characters, leading to a confrontation with a drug dealer known as "the Pin (Lukas Haas)."